Happy Birthday! Your special day is here at last and Birthday Wishes Barbie Doll is excited to join your celebration. This doll wears a beautiful dress with a sheer floral overlay. Details at the bodice, ruffled sleeves, and bow details make this sweet look ideal for a birthday celebration. Rosy earrings and a pearl ring add sparkle to Barbie doll's festive look. 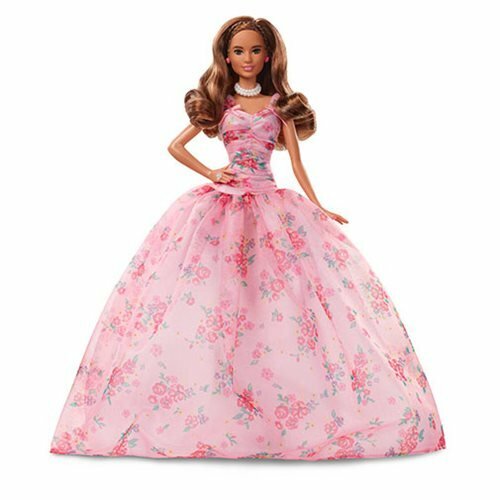 Packaging includes space to write a personalized message or birthday wish, making Birthday Wishes Barbie doll the perfect gift for that special birthday.